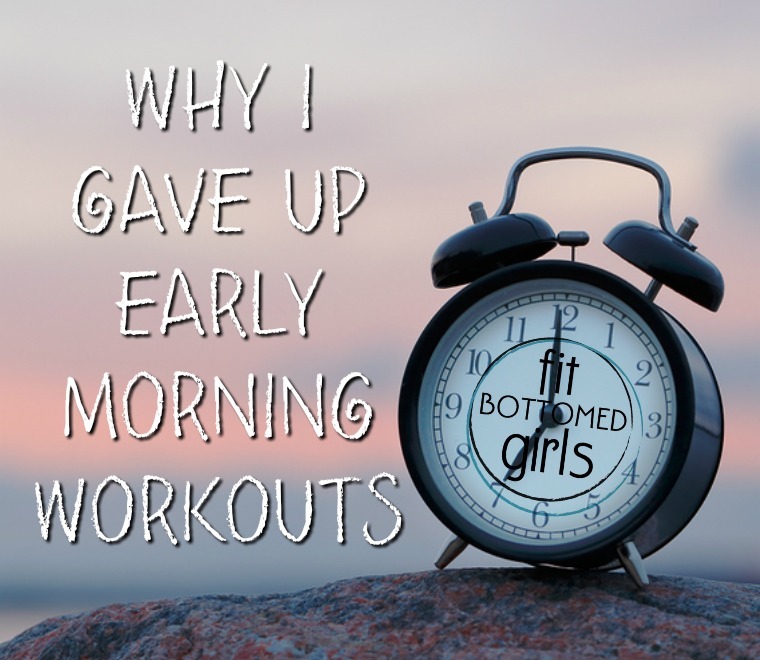 Because I have loved, loved, loved my early morning workouts. Hell, I recommended them (and still do) to so many people! They energized me. They put me and my fitness first. They made me feel like a badass. And I had to get real about what was really working for me — and what wasn’t. I had to become less rigid about, well, my life and schedule. I had to admit that I needed a change. While early morning workouts used to give me more energy than a pot of coffee, these days I’ve got a bit more on my plate. Kristen and I are pushing forward on a number of new projects here in the Fit Bottomed World that are taking serious creative energy and brave action outside of our comfort zones, I’ve got friends and family I want to spend quality time with … and I have an adorable high-energy toddler running around that I want to be 100 percent present for. If a workout is really, really hard, I don’t have the time now to recover on the couch. And the same early-morning workouts that used to pump me up now take so much out of me that I’m toast by 3 p.m. Which is why I had to make a change. I objectively looked at my life and took stock of exactly how and where my energy was being used. I then divided those times into areas that were in my control (food, workouts, thoughts/reactions, work, who I spent time with) and were out of my control (my daughter’s mood/needs, my husband’s work schedule, family obligations, chores), and set out to change what I could to have more energy to deal with the things I can’t control. Because, when you have the energy for it, EVERYTHING feels better and is easier. I got a little extra childcare. I hired the occasional housecleaning session. I recommitted to my 5-minute morning meditation. I asked my husband for more help with some logistical to-dos around the house. All of these things helped. But moving my early morning workouts to lunchtime has been major. MAJOR. Now I sleep in later, getting at least 8 hours of sleep. Then, I protect my time and honor myself by going to the gym over lunch. (It’s taken quite a lot of saying no to this and that — and blocking it off on my calendar in red — so it hasn’t been easy, but it’s been a priority and had my attention, so it’s happened.) And you know what? Doing so has given me so much more energy in the afternoons and evening. Because of it, I’m a happier (and therefore better) parent, wife, friend and daughter. I even feel like I’m consistently more productive and focused with work, too —despite being out for an hour or so of the day. All of this has been a great reminder for me of something that we talk about here a lot: Do what works for you. And, when it’s no longer working, look at it objectively and then change it up so that it works again. You may not get it right the first time … or the second time … or the third time … and once it’s “set” you still may have to change it all up again. (Who knows, maybe I’ll go back to early morning workouts at some point.) But you and your health and your goals are worth it. Protect that energy so that you can use it for what you were put here to do. Love this! I’ve had to do something similar over the past few months. I also never thought I would have given up early AM workouts but true mindfulness means never saying never. They just don’t work as well for me at this point in my life. Perhaps they will again though in the future. I always used to run in the mornings. But, just like you, I started to notice that a long run would seriously wipe me out and render me practically useless the rest of the day. Now, I do yoga most mornings to ease in to the day and hit the gym at lunchtime. Not only is it a much-needed break, but I feel way more present, productive, and energized the rest of the day. I would love to be able to work out in the morning regularly, because when I do I have that sense of accomplishment all day, but I also like to write in the morning when the house is quiet and my mind is open. Since I have to be at work by 7:30, it is not possible to workout and write in the mornings. I chose writing for the morning and workout immediately after work. I’m curious about how you do a lunchtime workout without getting too sweaty. I don’t have time to workout and re-shower in my lunch hour. I’d love to hear how you do it. Thanks! I’m not the early morning workout type of gal but if every day began with breakfast, a workout and then a loong hot shower, that would be a m a z i n g! Of course it rarely happens. So instead i get my workouts in in the evening and then just crash. It’s not my favorite way but it’s the only way i can make it work right now.